The number of Turkmens in Syria is not fully known, with unconfirmed estimates ranging between 800,000 and one million. Azerbaijanis in Armenia (Azerbaijani: Ermənistan azərbaycanlıları or Qərbi azərbaycanlılar, lit. 'Western Azerbaijanis') were once the largest ethnic minority in the country, but have been virtually non-existent since 1988–1991 when most either fled the country or were pushed out as a result of the Nagorno-Karabakh War and the ongoing conflict between Armenia and Azerbaijan. UNHCR estimates the current population of Azeris in Armenia to be somewhere between 30 and a few hundred people, with majority of them living in rural areas and being members of mixed couples (mostly mixed marriages), as well as elderly or sick. Most of them are reported to have changed their names to maintain low profiles to avoid discrimination. The Bashkirs (; Bashkir: Башҡорттар, Başqorttar, IPA: [bɑʂqʊrtˈtɑr]; Russian: Башкиры, Baškiry, pronounced [bɐʂˈkʲirɨ]) are a Turkic ethnic group, indigenous to Bashkortostan and to the historical region of Badzhgard, extending on both sides of the Ural Mountains, in the area where Eastern Europe meets North Asia. Smaller communities of Bashkirs also live in the Republic of Tatarstan, Perm Krai, Chelyabinsk, Orenburg, Tyumen, Sverdlovsk, Kurgan Oblasts and other regions of Russia, as well as in Kazakhstan and other countries. The Chelkans (native name - Shalgan) are a small Turkic people living in southern Siberia. Those residing in Altai Republic are sometimes grouped together with the Altay ethnic group and those in Kemerovo Oblast are grouped with the Shors; however, they are recognized as a separate ethnic group by ethnographers. According to the 2010 census, there were 1,181 Chelkans in Russia. The Chulyms, also Chulym Tatars, (self-designation: Чулымнар, Татарлар, Ӧс кижилер, Пестын кижилер) are a Turkic people in the Tomsk Oblast and Krasnoyarsk Krai in Russia. 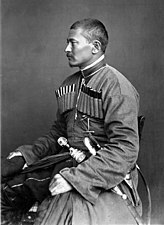 Dolgans (Russian: долганы; self-designation: долган, тыа-киһи, һака(саха)) are a Turkic people, who mostly inhabit Krasnoyarsk Krai, Russia. The 2010 Census counted 7,885 Dolgans. This number includes 5,517 in former Taymyr Autonomous Okrug. There are 26 Dolgans in Ukraine, four of whom speak Dolgan (2001 Ukrainian Census).Dolgans speak the Dolgan language. Some believe that it is a dialect of Yakut language. The Dolgan identity began to emerge during the 19th and early 20th centuries, under the influence of three groups who migrated to the Krasnoyarsk area from the Lena River and Olenyok River region: Evenks, Yakuts, Enets, and so-called Tundra peasants (Зату́ндренные крестья́не Zatúndrennye krest’jáne, literally "tundranized peasants"). Originally, the Dolgans were nomadic hunters and reindeer herders. However, they were prevented from following a nomadic lifestyle during the Soviet era and required to form kolkhozy (rural collectives) that – in addition to their traditional activities – engaged in reindeer breeding, fishing, dairy farming and market gardening. In 1983, the anthropologist Shirin Akiner claimed: "Dolgans enjoy full Soviet citizenship. They are found in all occupations, though the majority are peasants and collective farm workers. Their standard of housing is comparable to that of other national groups in the Soviet Union. "Most Dolgans practice old shamanistic beliefs; however, some are influenced with Eastern Orthodox Christianity. The Khakas, or Khakass (Khakas: Тадарлар, Tadarlar), are a Turkic people, who live in Russia, in the republic of Khakassia in southern Siberia. They speak the Khakas language. The origin of the Khakas people is disputed. Some scholars see them as descendants of the Yenisei Kirghiz, while others believe that, at the behest of the medieval Mongol Khans, the Yenisei Kirghiz migrated to Central Asia. It is believed that the Khakas people and Fuyu Kyrgyz are closer to the ancient Yenisei Kirghiz, who are both Siberian Turkic peoples (Northeastern Turkic), rather than the Kyrgyz people of modern Kyrgyzstan, who are Kipchak Turkic people (Northwestern Turkic). Khatun (Uzbek: xotin, Persian: خاتون‎ khātūn; Mongolian: ᠬᠠᠲᠤᠨ, khatun, хатан khatan; Urdu: خاتون‎, Hindi: ख़ातून khātūn, plural خواتين khavātīn; Bengali: খাতুন; Sylheti: ꠈꠣꠔꠥꠘ; Turkish: hatun) is a female title of nobility and counterpart to "khan" or "Khagan" prominently used in the Turkic Khaganate and in the subsequent Mongol Empire. It is equivalent to "queen regnant" or "empress regnant", approximately. The Old Uyghur alphabet was used for writing the Old Uyghur language, a variety of Old Turkic spoken in Turfan (also referred to as Turpan) and Gansu that is an ancestor of the modern Yugur language. The term "Old Uyghur" used for this alphabet is misleading because the Kingdom of Qocho, the Tocharian-Uyghur kingdom created in 843, originally used the Old Turkic alphabet. The Uyghur adopted this script from local inhabitants when they migrated into Turfan after 840. It was an adaptation of the Aramaic alphabet used for texts with Buddhist, Manichaean and Christian content for 700–800 years in Turpan. The last known manuscripts are dated to the 18th century. This was the prototype for the Mongolian and Manchu alphabets. The Old Uyghur alphabet was brought to Mongolia by Tata-tonga. is written vertically. The script flourished through the 15th century in Central Asia and parts of Iran, but it was eventually replaced by the Arabic script in the 16th century. Its usage was continued in Gansu through the 17th century.Like the Sogdian alphabet (technically, an abjad), the Old Uyghur tended to use matres lectionis for the long vowels as well as for the short ones. (This practice is also used to some extent in Modern Israeli Hebrew; where it is known as ktiv hasar niqqud, meaning, full spelling.) The practice of leaving short vowels unrepresented was almost completely abandoned. Thus, while ultimately deriving from a Semitic abjad, the Old Uyghur alphabet can be said to have been largely "alphabetized". Pan-Turkism is a movement which emerged during the 1880s among Turkic intellectuals of The Republic of Azerbaijan (part of the Russian Empire at the time) and the Ottoman Empire (modern day Turkey), with its aim being the cultural and political unification of all Turkic peoples. Turanism is a closely related movement but a more general term than Turkism, since Turkism applies only to Turkic peoples. However, researchers and politicians steeped in Turkic ideology have used these terms interchangeably in many sources and works of literature. Although many of the Turkic peoples share historical, cultural and linguistic roots, the rise of a pan-Turkic political movement is a phenomenon of the 19th and 20th centuries. It was in part a response to the development of Pan-Slavism and Pan-Germanism in Europe, and influenced Pan-Iranism in Asia. Ziya Gökalp defined pan-Turkism as a cultural, academic, and philosophical and political concept advocating the unity of Turkic peoples. The Tatars (; Tatar: татарлар, tatarlar; Russian: татары) are a Turkic-speaking people living mainly in Russia and other Post-Soviet countries. The name Tatar first appears in written form on the Kul Tigin monument as 𐱃𐱃𐰺 (Ta-tar). Historically, the term Tatars was applied to anyone originating from the vast Northern and Central Asian landmass then known as the Tartary, which was dominated by various mostly Turco-Mongol semi-nomadic empires and kingdoms. More recently, however, the term refers more narrowly to people who speak one of the Turkic languages. The Mongol Empire, established under Genghis Khan in 1206, allied with the Tatars. Under the leadership of Genghis Khan's grandson Batu Khan (c. 1207–1255), the Mongols moved westwards, driving with them many of the Mongol tribes toward the plains of Kievan Rus'. The "Tatar" clan still exists among the Mongols, Hazaras and Uzbeks.The largest group by far that the Russians have called "Tatars" are the Volga Tatars, native to the Volga region (Tatarstan and Bashkortostan), who for this reason are often also simply known as "Tatars". They compose 53% of population in Tatarstan. Their language is known as the Tatar language. As of 2002 they had an estimated population around 5 million in Russia as a whole. There is a common belief that Russians and Tatars are closely intermingled, illustrated by the famous saying "scratch any Russian just a little and you will discover a Tatar underneath" and the fact that a number of noble families in Tsardom of Russia and Polish-Lithuanian Commonwealth had Tatar origins; however, genetics show that majority of Russians form a cluster with Northern and Eastern Europeans (especially Belarusians, Ukrainians and Poles), and are relatively far from Tatar peoples. 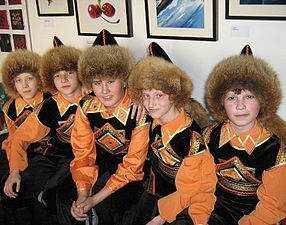 In modern-day Tatarstan, however, Russian-Tatar marriages are very common.Owing to their diverse heritage, Tatars have a vast range of appearances, ranging from East Asian to European. Telengits or Telengut are a Turkic ethnic group primarily found in the Altai Republic, Russia. Telengits mainly live in a territory of Kosh-Agach District of the Altai Republic. They are part of a larger cultural group of Southern Altaians. These other groups include: Altai, Telengut and Tolos. Teleuts are a Turkic people living in Kemerovo Oblast, Russia. According to the 2002 census, there were 2,650 Teleuts in Russia. Their language is classified as a southern dialect within the group of dialects called the Altay language. Below is the identified timeline of the History of the Turkic peoples between 6th and 14th centuries. Although the chronology of the Seljuq Sultanate of Rûm is covered in this timeline, for a more detailed timeline for the Seljuq Sultanate of Rûm see Timeline of the Seljuq Sultanate of Rûm. For a timeline of the modern Turkish state and its legal predecessor see Timeline of the Ottoman Empire and Timeline of Turkish history. Beyond what is described in this timeline, Turkic peoples have lived outside of the Ottoman Empire and Turkey, such as in Azerbaijan and the Central Asian republics of former USSR as well as Russia, China, and Iran. 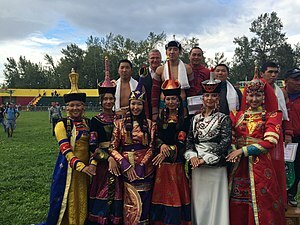 Tofalars (Тофалары, тофа (tofa) in Russian; formerly known as карагасы, or Karagas), or the "Tofa people", are a Turkic people in the Irkutsk Oblast in Russia. Their origins, Tofa language, and culture are close to those of the eastern Tuvans-Todzhins. Before the 1917 October Revolution, the Tofalars used to be engaged in nomadic, living in the taiga; they engaged in reindeer husbandry and hunting. The Tofalars were resettled by the Soviet government by 1932. Young Tofalars learned Russian at new Soviet-built schools, while cultural traditions such as hunting and shamanism were discouraged or prohibited. According to the 2010 census, there were 762 Tofalars in Russia (2,828 in 1926, 476 in 1959, 570 in 1970, 576 in 1979, 722 in 1989 and 837 in 2002). Turks in Pakistan are expatriates from Turkey and their descendants, consisting of students, military personnel, academics and people married with Pakistani citizens. Turkish educators in Pakistan are involved with the PakTurk International Schools and Colleges, which has 25 branches in the country. As of 2016, there were over 100 Turkish educators teaching at these schools, and including their families gave a population of 400 Turks.